BREAKTHROUGH UPGRADE: One key to lock/unlock screen. also designed with Independent Volume Control, Give you a more user-friendly experience .You can Switch songs or adjust the vol by our IN-Line control earphone,with 1.1 oz mini size body, Perfect for your outdoor and gym fitness. 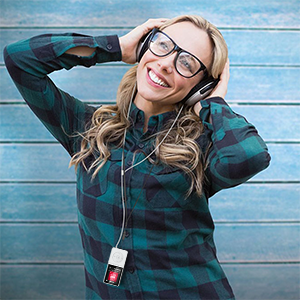 AGPTEK MP3 player bring you beyond imagination stereo sound feeling at a affordable price, with a foolproof operation that has all main functions visible at a glance. Ideal music patner for adults and kids.Genuine AGPTek Product. Avoid Low quality copycat. 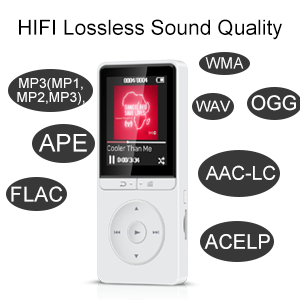 The High fidelity lossless sound, support audio formats: MP3, WMA, OGG, WAV, APE, FLAC, and ACELP (Not support Audible and WMA DRM directly). 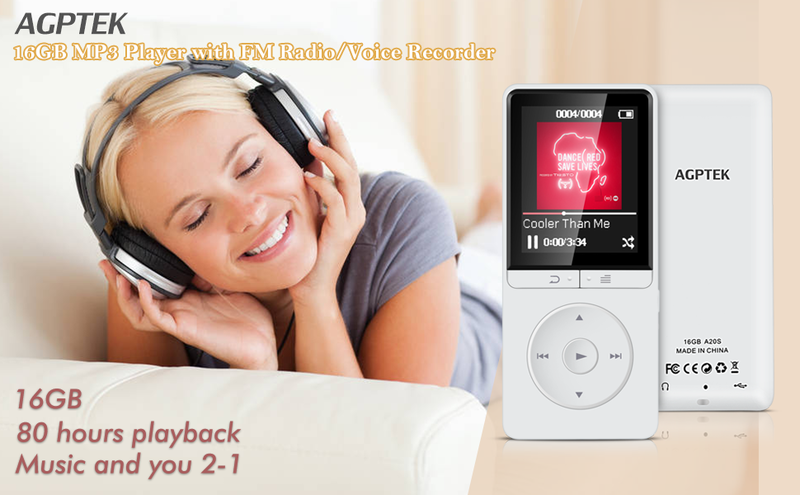 It can shuffle songs in any one of the playlist you created, artists, albums, etc. aviod being pressed by accident. You can press and hold the “Menu” button to lock the screen. This will remember and continue to play music from where you left off last time! And you can enjoy reading E-books and listening to music at the same time. 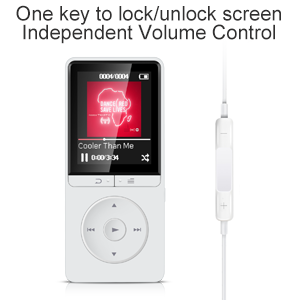 16GB Internal Capacity.The memory card slot can support 64GB, That will be no songs limitation if you choose music from Folder option.To avoid incompatibility, please use AGPTek Memory Card. Works perfectly with Car via AUX port. Noise cancelling 20 hours recording (even more with memory card). Speak to it whenever any inspiration comes to your mind. AGPTEK A20S mp3 player delivers rich sound quality that helps make your commute and workouts more pleasurable. It’s only with 1.1 oz mini size body, Perfect for your outdoor and gym fitness. You can take it everywhere you go, Running or Travelling. It is small enough to fit into a purse, pocket and a handbag. 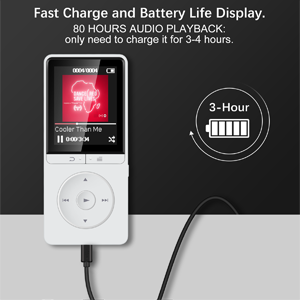 You can enjopy the music 80 hours while you only need to charge it for 3-4 hours. You can charge it in computer or with the general charger which output is “5V, 0.5-1A”. Start to play your favorite music. It’s a great riding companion. Add more excitement to your whole riding journey. Never worry about running out of battery with long battery life. 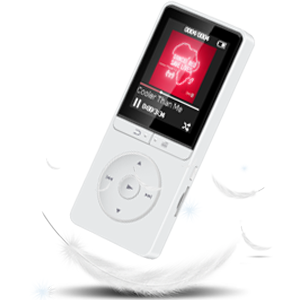 ​The built-in 16GB Internal Capacity for up to 4000 songs, supports up to 64 GB Micro SD Card! (To avoid incompatibility, please use AGPTEK Memory Card). Add your favorite songs or audio book.Share Your Wonderful Life. Perfect for your outdoor and gym fitness.